These Gemstone Trees (Feng Shui Moneytree) are handmade in India with real gemstones and mounted on gemstone rock bases. If you want wow-factor build yourself a Gem Forest display with info on the different stones. The branches can be artfully arranged, and naturally they never need pruning or watering! Gemstone Trees There are 4 products. 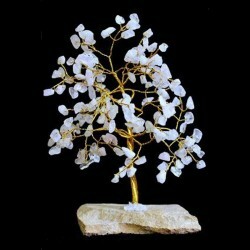 Rose Quartz gemstone tree is handmade in India of genuine Rose Quartz stones. The branches of the tree can be arranged artistically, and of course, gemstone tree never needs pruning or watering! Rose Quartz gemstone tree is approx. 24cm high. 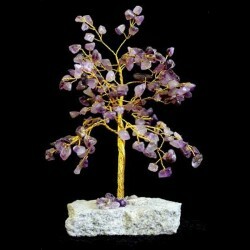 Amethyst gemstone tree is handmade in India of genuine Amethyst stones. The branches of the tree can be arranged artistically, and of course, gemstone tree never needs pruning or watering! Amethyst gemstone tree is approx. 24cm high. Moneytree - a Gemstone Feng Shui Tree, handmade in India of Natural Stone in 7 Chakra colors. Beautiful genuine stone tree is 20-25cm high. Approx. 160 gemstones.Perfect as a gift for home! Moneytree - Jade Green Gemstone Feng Shui Tree, handmade in India of Natural Stone. Beautiful genuine Jade Green stone tree is 20-25cm high. Approx. 160 gemstones.Perfect as a gift for home!